Hello and welcome to Adam's Ministry. 2nd Edition in Paperback Coming Soon! Authorised King James Bible in black. Sorry, but we do not sell the Jefferson Bible. Irrefutable proof of the Revelation of Jesus Christ can be found in Revelation Chapter 6. When applying Adam's interpretation of the Four Horsemen of the Apocalypse, the odds are overwhelming. As I said earlier, my faith in Jesus ensures there are no risks in the decisions I make, and upon entrusting Him with our lives, they then become predetermined, predetermined for success. Until then we were lost, presuming to be in control of our own lives and making a complete mess of them. But now things are more promising, because we have given the most able man in the universe permission to make a few changes, to decide what is best for us . . .
Chapter 11: Awake Ye Sleepers! - The Old Babylon is present day Iraq and is experiencing mass conflict. Combined with its neighbouring countries, this is presently the world’s hottest war zone. - New York matches every single description of the New Babylon very precisely. - We are overdue a super eruption that would fulfil future prophecies . . . Oblivious. God has designated his target. Discover the location of the New Babylon of John's Revelation on Google Maps . . . In the Book of Daniel, King Nebuchadnezzar calls for his magicians, enchanters, and wise men to interpret one of his visions. He then demands them to tell him his vision and its interpretation or else he will have them all burned in a fiery furnace. Bewildered by such ridiculous orders, none are able to do so. All except one man: Daniel . . .
Hello everyone. My name is Adam, welcome to my ministry. Do you have questions about the Bible that have not yet been explained? Is there a doubt causing you to disbelieve? Do you question God's judgement or want to know why He work's so mysteriously? Are you interested in learning more about the Book of Revelation and end-time events? Would you like to discover other mysteries of the Old Testament? If your answer to any of these questions is yes, then I highly recommend this book . . .
Getting saved is a joyous and unforgettable moment for everyone and nothing compares to it. It inspires us, motivates us, teaches us to live, and we are awakened, we step into a different realm, we view the world differently now because we have witnessed the great architect at work within our lives; we have witnessed the overwhelming and ineffable love and compassion from a God who will miraculously turn everything in our favour now we have chosen to make Him a priority. . . .
"I aint gonna play with your ears." 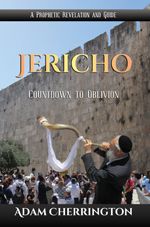 Second edition of Jericho out now in Kindle format! https://t.co/JlQ76sVP7E Paperback coming soon. Exclusive Tom Cruise interview on the Red Dragon of Revelation 13 and a communist takeover of the world via Hollywoodism. Choose the blessings and not the curses. Adam explains God's game plan and why it is important for conspiracy theorists especially. This and much, much more. So join me and many others in our quest for the truth. It is our ultimate mission to bring as many people as possible to our Lord and Saviour Jesus Christ. For the wheat has grown tall, the harvest is ripe, and the time has now come to reap, to separate the tares from the wheat and cleanse the spirit as we endure our faithful journey into the promise land. Who else is prepared to follow us in the footsteps of our Saviour, down the longsuffering path of the righteous man? Come, let us lift up the name of our Lord Jesus Christ, king of kings, mover of mountains, maker of the heavens, saviour of the world! Bless ye the Lord and praise Him, and magnify him forever and ever! Amen. Adam's new book is now available in paperback. Click here for digital format. Please help me build God's church. I need you! to help me continue my work, reveal the truth, and save as many souls as possible.